This Veal Cutlet Milanese recipe given to us from Chef Sal Scognamillo was one of many dishes Frank Sinatra enjoyed at Patsy's in New York. It's no secret Patsy's was Mr. Sinatra's favorite restaurants for decades. To this day his family still dines there whenever they're in town. This great dish was named after the Italian city in which it was created, Milan. It's tender meat and lemony flavor makes this a great choice for lunch or dinner. You can serve this < b> dish with a nice arugula salad or with a side of pasta. Enjoy! Break or cut the bread into large chunks and place in a food processor. Process until the bread is reduced to fine crumbs. Transfer the crumbs to a large bowl and stir in the cheese, oregano, and parsley. Gradually add 3 tablespoons of oil, stirring, until thoroughly combined. Spread the flour on a large plate, place the eggs in a shallow bowl, and spread the seasoned bread crumbs on a second large plate. Coat each veal cutlet in the flour, then the beaten eggs, and then the bread crumbs, patting with the palm of your hand to ensure adhesion. Heat 1 cup of the oil in a large nonstick skillet over medium-high flame (to a frying temperature of 350 F) and saute the veal for 2 minutes. Turn and saute for 1 additional minute. Do not crowd pan. If necessary, fry the cutlets in batches. Season to taste with salt and pepper, and serve with lemon wedges. 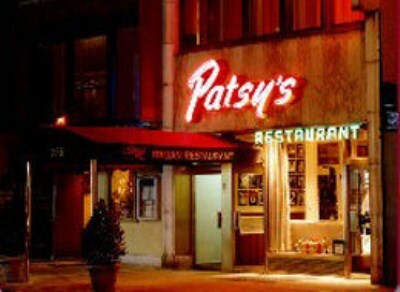 For reservations and menu, visit Patsy's website.